TRAVERSE CITY, Mich. -- "Life is a bowl of cherries," goes the old saying. 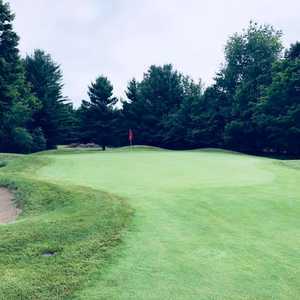 In Traverse City, for decades a favorite summer vacation destination for families throughout the Midwest, life really is a bowl of cherries - and a stringer of salmon, a big cup of quarters, a bottle of chardonnay, and a bucket of range balls. In fact, given the concentration of world-class golf combined with a plethora of off-course activities, Traverse City is quietly becoming one of the premier golf destinations in the country. There's no getting around the facts of the current national golf market: The boom is over, rounds played are down, courses and resorts are struggling. Check that. There's no getting around the facts unless you're located in Traverse City. From the upscale full-service Grand Traverse Resort and Spa to your more traditional golf-condo resorts such as A-Ga-Ming, owners are reporting small but steady year-on-year growth in terms of both number of rounds played and revenue. And expansion is underway. "Even with the poor economy," says Tom McGee, Golf Operations Manager at Grand Traverse Resort in Acme, "rounds increased 3 percent in 2002 as compared to 2001, and so far, 2003 has been up over 2002." John Jessup, Marketing Director High Pointe Golf Course in nearby Williamsburg, also reports no declines in year-on-year rounds played over the past couple of seasons. Traverse City is the epicenter of the remarkably diverse northwest Michigan golf scene. From Benzie County south of Traverse City to Petosky to the north, a devoted duffer could play a different 18 every day pretty much all summer. And given that the area is at the far western edge of the Eastern Time Zone, that duffer could play till almost 10 p.m. each night, too! 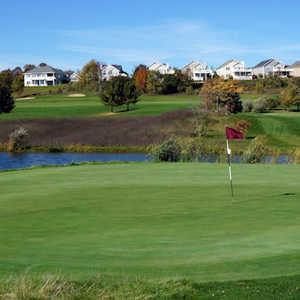 With three courses and amenities galore, the king of Traverse City golf is the Grand Traverse Resort. The jewel in the resort's golf crown is The Bear, a par-72, 7,065-yard Jack Nicklaus design that has hosted the Michigan Open since 1985. From the highly recommended white tees, the slope rating is an intimidating 144, even though the yardage is a non-threatening 6,176. The Wolverine (par-72, 7,038 yards), designed by Gary Player, and Spruce Run (par-70, 6,304 yards), designed by Bill Newcomb round out the resort's considerable golf offerings. Although green fees are highest in the area (see below), several stay and play packages are available, including ones incorporating treatments in the resort's opulent spa. For a more traditional golf trip either with "da guys" or with a significant other, the golf condos at the A-Ga-Ming Golf Resort in Kewadin offer inspirational views of Torch Lake, along with the best stay and play package in Traverse City. "We are one of the top three golf resorts in the area," says Mike Brown, Director of Golf at A-Ga-Ming, "but in order to compete, we needed to pool our resources with some other courses to offer variety." The result, the Traverse City Triple Play includes one round each at A-Ga-Ming, The Chief in Bellaire, and High Pointe in Williamsburg plus accommodations in the condos for just $249 per person during peak season. Both the price and the courses are hard to beat. A-Ga-Ming (par-72, 6,667 yards) is a classic Jerry Matthews layout, overlooking Torch Lake. The scenic and very playable course boasts more rounds than any other in northern Michigan, and for this reason, the owners are adding another 18-hole Matthews course to open in 2004. A-Ga-Ming means "on the shore" in the Ottawa language, and the views of Torch Lake alone, both from the course and the clubhouse, are worth the green fees. The Chief (par-72, 6,600 yards) is a bent grass thrill-ride, and from the tips might play even harder than its brutish 145 slope rating suggests. The John Robinson design puts a premium on accuracy, with numerous semi-blind tee shots, landing areas, and greens. Another Robinson design located just up the road, Hawk's Eye, will have all 18 holes open by fall 2003 (nine are currently open), and offers more playability on equally lovely landscape. High Pointe Golf Course (par-71, 6,890 yards) is now-famous course architect Tom Doak's (Pacific Dunes) first solo design, and was once ranked in the Top 75 public courses in America. The front looks and plays as if it were transported magically from Scotland, whereas the back plays like your typical northern Michigan woodland course - variety without (much) incongruity. Most area courses offer packages with many of the bayside hotels along Traverse City's "Miracle Mile," including the Waterfront Inn and the Cherry Tree Inn. One such course, LochenHeath Golf Club (par 71, 7,049 yards), has garnered national acclaim. In 2002, the Steve Smyers design found itself on Golf Magazine's Top 10 Courses you can play list. LochenHeath is a "member's course" in every sense of the word; the heavily contoured fairways and greens require local knowledge and experience to score well, and at some point in the future, the course will turn private. Finally, if you want a taste of yesteryear class in the heart of Traverse City, the one and only option is the Park Place Hotel. Built in 1930 and included on the Michigan Register of Historic Buildings, Park Place Hotel is still Traverse City's tallest building, and on its roof is a functioning, official Coast Guard Beacon. Located next to downtown beaches, restaurants, the zoo, and scads of chic boutiques, this is the perfect place for family vacations. Golfers can take advantage of several stay and play options, and non-golfers can walk to the attractions. One of Park Place's newest packages is the Sip & Chip. For less than $300, you get two nights accommodations, dinner for two with a tasting of Leelanau Peninsula wines, and golf for two at one of eight area courses, including the three year-old Leelanau Club at Bahle Farms (par-71, 6,651 yards). This as-of-yet hidden gem is an extremely memorable, visually stunning course that winds its way around valleys, over ridges, and through cherry orchards. The vista from the tee on No. 11 is arguably the best on any area course. As great as the golf courses are, Traverse City golf is growing for one main reason: Golfers keep coming to Traverse City because golfers' families keep coming to Traverse City. Tracy Kurtz of Swope-Kurtz Marketing and formerly of the Visitor's Bureau, sums up the allure of the area like this: "The glaciers were good to us." And we're not just talking about goof golf course terrain. Traverse City lies at the south end of Grand Traverse Bay, which is separated from the rest of Lake Michigan by the Leelanau Peninsula. The Bay is further subdivided into the West Bay and East Bay by the Old Mission Peninsula. No matter where you go here, you feel like you're surrounded by some of the most heartbreakingly blue water you've ever seen. Two local inland lakes -- Torch Lake and Glen Lake -- have even been listed in the Top Ten Most Beautiful Freshwater Lakes in America by National Geographic Magazine. So from world-class sailing to charter fishing for king salmon to fly-fishing in the Boardman River to Sleeping Bear Dunes National Lakeshore just outside of Traverse City, the range of water-related activities is second to none. The glaciers also left behind some fine soil, perfect for growing cherries (Traverse City is the Cherry Capital of America) and grapes. Nearly a dozen vineyards and wineries have sprung up over the last 20 years on the two craggy peninsulas. On the Old Mission Peninsula, two don't-miss vineyards are Chateau Grand Traverse and Chateau Chantal. The former produces the larges variety and volume of wines in Michigan, and specializes (as do all local vintners) in Rieslings and chardonnays. Chateau Chantal has perhaps the largest selection of reds, and hosts summer jazz concerts on Thursday evenings. Both have B&Bs on-site, and offer free tastings daily. But natural splendor and alcohol aren't the only thing keeping vacationers coming back. "Because of the amazing golf and the casinos," jokes Kurtz, "we like to say that we play 18 by day and 21 by night." The Turtle Creek Casino and Leelanau Sands Casino, both owned and operated by the Grand Traverse Band of Ottawa and Chippewa Indians, offer big-city glitz and action in the heart of Michigan's north woods. On top of the copious slots and table games, the casinos draw national acts from Wayne Newton to The Moody Blues to Martina McBride. "The Band leadership is committed to bringing world-famous shows to town," says Kurtz. "Last year Cirque de Sole was here, and this year the Imperial Circus of China is coming. These are family shows where kids are welcome and the ticket prices are affordable." The prestigious Interlochen Center for the Arts also brings in national headliners for intimate concerts, including Center graduates such as Jewel and Nora Jones. The bucolic serenity of the area and the friendliness of the people living here also attract celebrities on their own vacations. Episodes of Home Improvement were often filmed in the area (once in Kurtz's parents' back yard), and Tim Allen has a house here. One newer local homeowner of whom you may have heard is Bruce Willis, whose daughter was just accepted into Interlochen. If you look at the well-known mitten-shaped map of Michigan, Traverse City and the nearby peninsulas are located at the tip of the "little finger." If residents now and then boast that their city has more to do -- and arguably better golf -- than many states have in their whole bodies, who can blame them? We should just be happy that there are enough cherries in this great big bowl to share with the rest of us.